The first adult film I ever saw as a child was “The Graduate”. It had a profound affect on me. Although I was too young to understand the nuance and meaning of what was going on, I was emotionally taken by the beauty of Dustin Hoffman’s turmoil, the sun baked 60’s dream of California and the Simon and Garfunkel soundtrack. It wasn’t until I was in college when I understood the meaning of the film to its fullest. As college students, standing on the threshold between childhood and adulthood, where do we go? Here we are – some of us all stars in school, track phenoms, valedictorians, big man/lady on campus (others not) until we turn the tassel of our caps to the other side on commencement day (“commencement”= the beginning of something), and then the real work starts. A little hot-shot fish in a big, giant paranah eating world. So much pressure is on our shoulders. What are we supposed to bring to the world? Do we live our dreams, or place ourselves in boxes, allowing the conventional constraints our families and society impose to stifle us? Or do we break the pattern of living unconsciously, day by day. My heart still aches at the site of Benjamin screaming from the window door atop the church, crying, screaming “Elaine!” just in the nick of time, just before she was about to make the biggest mistake of her life. Then, the astounding, groundbreaking last scene. Two young people having just fought off an army of tight jawed, bigoted, good-ol-boy, country club robots, locking them into the church – a clan of hypocrites in their house of God (which in some cases, is known for its hypocrisy). The getaway…a bride, breaking the cycle of her mother’s deadness. The bus. The laughs. The looks. The realization of…”Now what?”. The fear, as the confused couple rides into the sunset. This was never done before in film. The anti-happy ending. 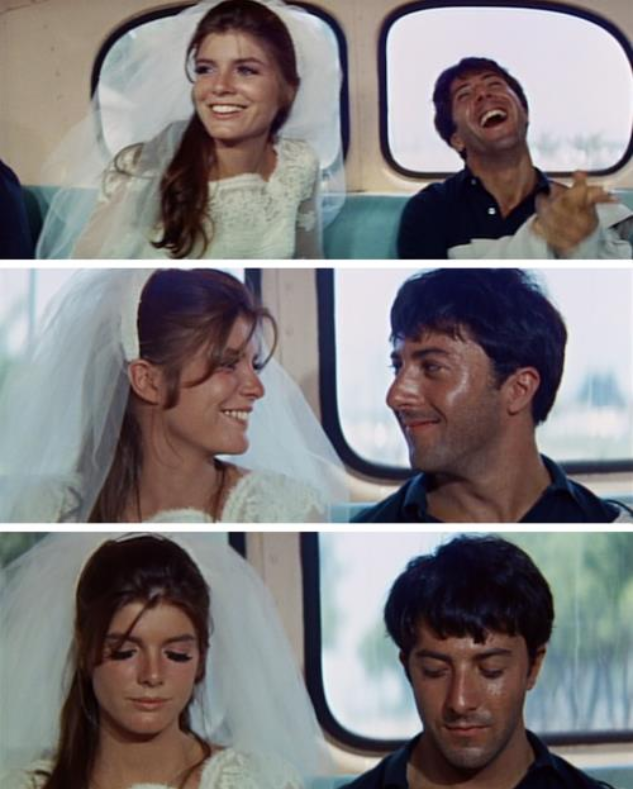 Although the screenplay of “The Graduate” was written by the fantastic Buck Henry, Mike Nichols had the vision that brought this story to life in a way no other director could. His intelligence and sensitivity to the characters, plus his humorous view of the world, as per his legendary comedy career with Elaine May, made this story a voice for a generation. Some other favorite Mike Nichols films for me are: “Heartburn”, “Working Girl”, “The Birdcage”, and “Angels in America”. Brilliant projects that have stayed with me for years. I plan on viewing more of his work this weekend. There are just too many amazing people passing away this year. Some before their time – others whose time was up. Sad to end a year this way. Rest in peace, Mr. Nichols. Categories: Thursday's 'Getting Through' | Tags: Cinema, Elaine May, Film, Mike Nichols, The Graduate | Permalink.